Our visit to Jasper was the perfect start to our time in the Canadian Rockies. Jasper is a mellow little mountain town that quickly became one of the highlights of the trip. We weren’t thrilled to be leaving after just three days, but we were excited about what lay ahead: the Icefields Parkway and quaint towns within Banff National Park (Lake Louise, Banff, and Canmore). 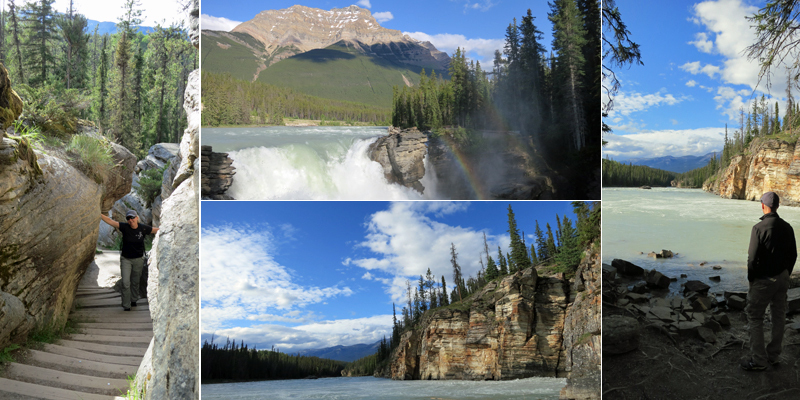 On our last morning in Jasper, before we hit the road, we paid a visit to the Athabasca Falls, directly across the street from our wilderness hostel. At the thundering falls, the Athabasca River tumbles nearly 100 feet through a canyon before mellowing out in the flats on the other side. After seeing the falls and hiking around a bit, we headed south on Rt. 93, also known as The Icefields Parkway and widely recognized as one of the most scenic drives in the world. A mini-tour of the Icefields Parkway, with incredible views in every direction. The parkway delivered on its promise of sweeping vistas and incredible scenery. We found ourselves stopping every few miles to snap a picture or get out of the car to admire the view. And although our compulsory visit to the receding Athabasca Glacier was interesting, it was more our speed to hike high above the glacier on an 8-mile trek into Wilcox Pass. We parked at the trailhead just past the glacier’s visitor center and quickly gained elevation as we climbed above the parkway. Our visit up to the edge of the Athabasca Glacier and then high above it as we hiked into Wilcox Pass. The trail terrain varied from easy dirt paths across alpine meadows to areas of steep rock scrambling and random water crossings. We hiked for 2 or 3 hours, reaching an elevation of more than 8,000 feet, before retracing our steps to the car. Hiking to the pass was the perfect end to our visit to Jasper and a good introduction to the scenery awaiting us in Banff N.P. Up next: our first stop inside the park at Lake Louise. This entry was posted on August 15, 2013 by Words Per Gallon. It was filed under Driving, Geography, Hiking, Lodging, National Parks, Travel and was tagged with Athabasca Falls, Athabasca Glacier, Banff, Icefields Parkway, Jasper, National Park, Wilcox Pass. It is so relaxing to read these updates. Thanks!